You can access BPI express online and your other BPI favorite sites without using you BPI prepaid load with the 160th Commemorative Sticks. These broadband sticks are specially priced and will be delivered to you free of charge. 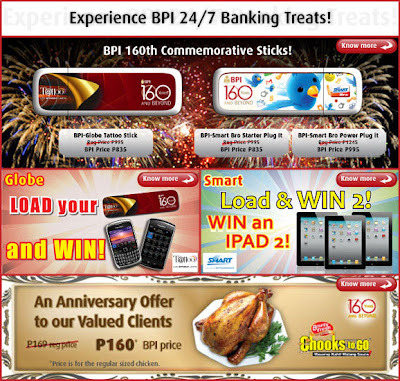 Plus you can get a chance to win a Blackberry from Globe and an Ipad2 from Smart whenever you reload your sticks through BPI 24/7 banking Channels. Visit BPI express online 24/7 banking for more details.